Eagerly waiting for the Galaxy S7, Samsung's smartphone flagship that will try to steal our attention sometime in early 2016? Well, we certainly are, and all the more impatient to actually lay our grubby paws on the Galaxy S7. Previously, we had heard that Samsung is gearing itself to announce the device in late February 2016 and release it on the shelves roughly one month afterwards, in mid-March. This rumor has been going on for some time and it actually kind of falls in line with what we are expecting, which has announced its most recent three flagships in the February-March time window and released them in April. 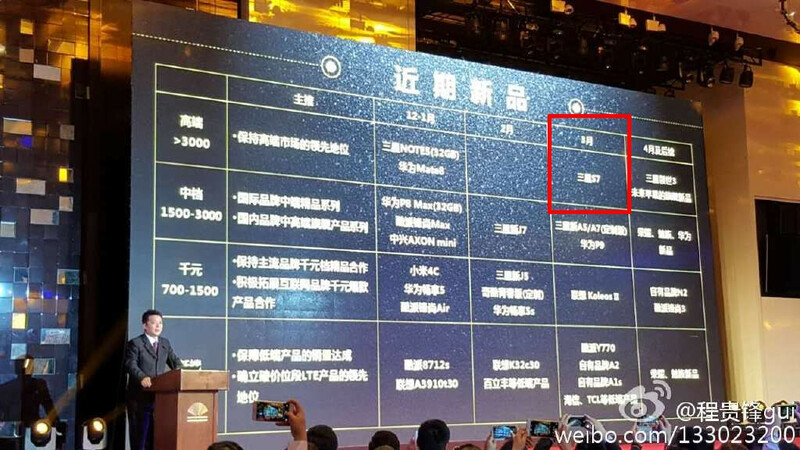 A new piece of info coming straight from China Mobile might be further supporting our suspicions - a leaked image that reportedly depicts the roadmap of China's largest carrier suggest that it will launch the phone in March 2016. Provided that Samsung releases the Galaxy S7 and possibly its "edge" variation in China and all other markets at the same time, it is almost certain that the worldwide launch of the flagship will take place in March. Additionally, China Mobile's leaked roadmap also gives us a hint or two about the price of the device: apparently, it will be priced above 3000 Yuans, which exchange for more than ~$469. Well, that's not surprising, as the Galaxy S7 will be a top-end device; we actually expect it to cost a bit more - rumors say Samsung will put a 650-dollar price tag on the most basic version of the phone. We can already paint quite a descriptive picture of the Samsung Galaxy S7, specs and all. Our extensive rumor review of the device is worth checking out, but here's the gist of what we expect from Sammy's next flagship at this point: a 5.2-inch, Super AMOLED display, with a Snapdragon 820 or an Exynos 8890 chipset depending on the version, a 20MP reart camera with a RGBW-pixel Britecell sensor, all encapsulated together in a magnesium, Galaxy S6 look-a-like. For additional info about the Galaxy S7, be sure to check out our extensive rumor review. Patiently waiting for the beast! bettin on force touch? what say? Already have 3D Touch on my 6SP. If the S7 has it then even better. My bank account is ready, reveal yourself S7!